Mixed use is a global phenomenon. Fluid in scale and focused on context, it works best when it draws on the intangibles, not the least of which are the people it attracts. Gensler designers talk about mixed use’s destination value—the ability, at every scale, to spark vitality and urbanity where they’re needed most. The Gulf is a good starting point for considering how making destinations has moved to the forefront. Before Chris Johnson and his team designed The Avenues in Kuwait City, they visited the capital cities of shopping—renowned worldwide for their retail districts. Msheireb Downtown Doha has what Philip Gillard calls a civic scale: 95 buildings—30 designed by Gensler—on 31 hectares (76 acres). Local inspiration matters. “The client wants it to be quintessentially Qatari,” he adds. Climate is a factor: Doha gets hot, but benefits from cooling winds off the Gulf. Seaside views are popular. A C-shaped plan and buildings that step up as they move away from the sea deliver both. The housing is mixed to cater both to expats and typically large Qatari families. “It’s not only about size. The required spaces and how they’re laid out differ from the usual expat standard,” says Lukasz Platkowski. In Lagos, Marty Borko and Bart Tucker designed an urban precinct at Eko Atlantic, a new area of the city built on land reclaimed from the sea. It reflects the city’s rising middle class, on the hunt for better quarters: walkable, amenity-filled, and safe enough not to need security fences. Lagos lacks transit, so Eko Atlantic residents will have cars and drivers. Families are large, with live-in help. “There’s very little market data or precedents,” Borko says. “The plan allows course corrections. We can change the mix between two- and four-bedroom units depending on what’s selling.” Eko Atlantic “breaks with the local pattern in Lagos of developing isolated towers. Even without transit, mixed use saves people a lot of time,” Tucker explains. In Sri Lanka, a team led by Kap Malik and Garo Balmanoukian designed ITC One Colombo 1—with 350 hotel guest rooms and 135 residences—for the Indian hospitality group ITC. It is aimed at that country’s fast-growing regional travel market. The project’s two towers are linked by a sky bridge with a pool and piano bar. Each tower has shading fins that are tinted to emulate the ocean water. Balconies are accented with durable wood-grained panels that recall local timber construction. “We visited some breathtaking houses by Sri Lanka’s renowned Geoffrey Bawa to understand how we could bring a modern sensibility to the island’s architectural traditions,” Balmanoukian says. Four large developments in Korea and China illustrate how destinations fit into the dense fabric of their major cities. Located in Seoul’s upscale Gangnam district, the largely subterranean COEX Mall—85,000 sm (915,000 sf) in area—was devoid of light and life. 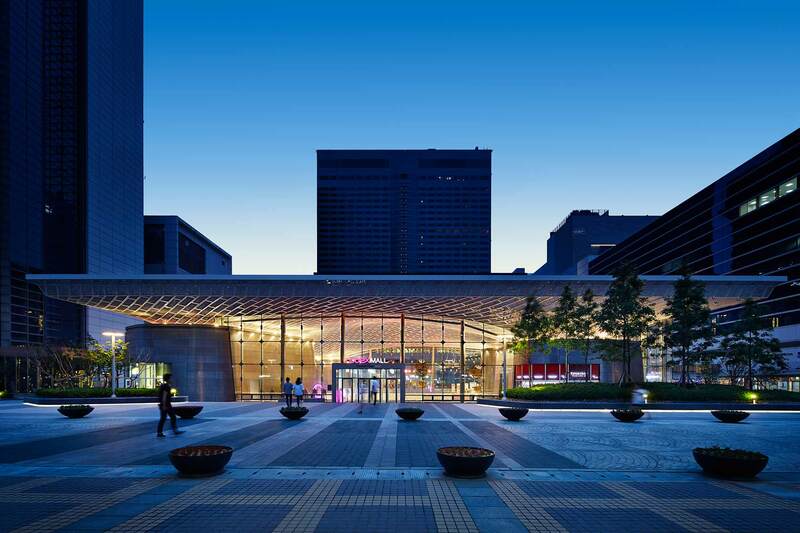 With Korean partners, a Gensler team led by Duncan Paterson opened it up with a distinctive theme, “the unfolding sky.” The centerpiece is a grand atrium whose cloudlike roof reaches up to light and air. “It gives Gangnam a heart, accessible from the subway and the street,” Paterson says. A similar relationship occurs in Nanjing’s World Trade Center, where Hasan Syed and his team designed a sunken plaza above a metro station that connects passengers to a retail podium, two residential towers, an office tower, and a five-star hotel. It anchors Nanjing’s regional financial district, with a mix of uses that meet the financial sector’s need for a full range of urban amenities. Preserving a tie with history was Syed’s strategy for BM Plaza, a mixed-use development along Shanghai’s Suzhou Creek. In planning its third phase, he reviewed the site’s existing buildings, opting to restore four villas in the city’s shikumen tradition. “Preserving this history locates BM Plaza in time,” Syed says. BM Plaza pairs a school with office, hotel, and residential uses. Adding culture to mixed use is a trend now in China, so a museum was also considered. In Shenzhen’s Qianhai precinct, Shamim Ahmadzadegan and his team planned and designed Shimao Canal City, a high-end destination within a free trade zone across the bay from Hong Kong. “China’s megascale has an outsize impact,” he says. “Designing for context means relating a destination to a city’s larger setting, economy, and population.” What Gensler envisioned is a walkable, urban quarter that relates to Shenzhen’s canals and the bay. 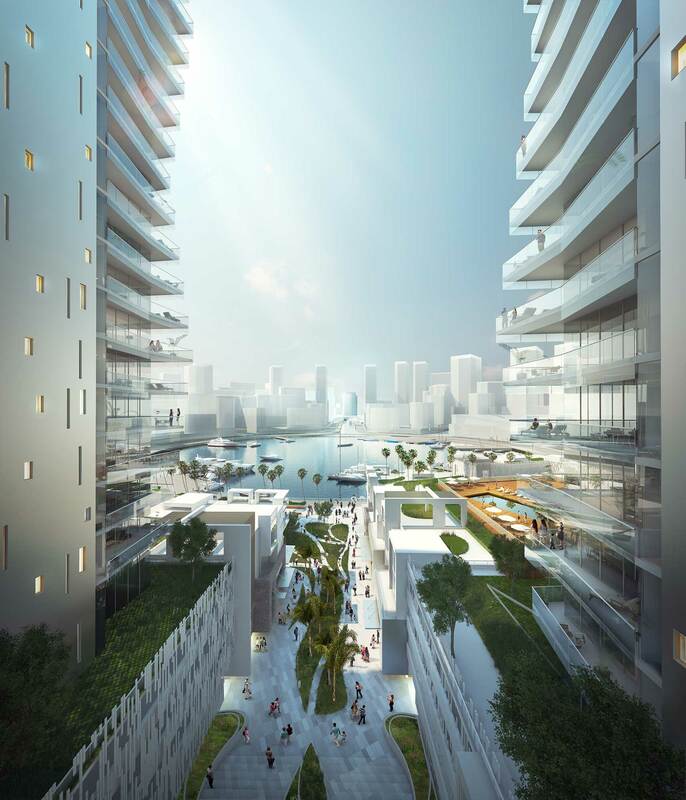 The development’s lower levels are surrounded by water elements that reference its history as a waterfront site. Yet it also relates to Shenzhen’s terraced rice fields and the mountains and their valleys. Billed as an executive lounge, part of a repositioning strategy aimed at attracting creative tenants, The Porter mixes food and beverages with work and meeting spaces. Haworth was a strategic partner in The Porter’s development as a curated experience, and continues to operate the space. The project exemplifies a trend also seen in US cities: office buildings are gravitating to mixed use. Mixed use is a growing category in Central and South America. In Santiago, Chile, Gensler is helping to expand Parque Arauco. “It opened as a mall in 1982,” Tom Ito explains. “People still feel an emotional connection to it.” Ito’s and Malik’s design revives the shopping component, adds new hotel and office towers, and links the project to a nearby park to create a larger destination in the heart of Santiago’s Las Condes district. In Heredia, home of the National University of Costa Rica, Ronald Fonseca and his team are designing Plaza Andén for Grupo Aliss. “It’s a transit hub—buses and trains. We’re making a place where people can stop, shop, eat, and enjoy cultural events.” In San José, Christian Wolff is focused on an urban-scale mixed-use development that includes a sports facility and a large outdoor plaza. “The city lacks places to shop or stroll leisurely. This will provide them,” he says. As in China, culture plays a role in Latin America’s mixed-use destinations. 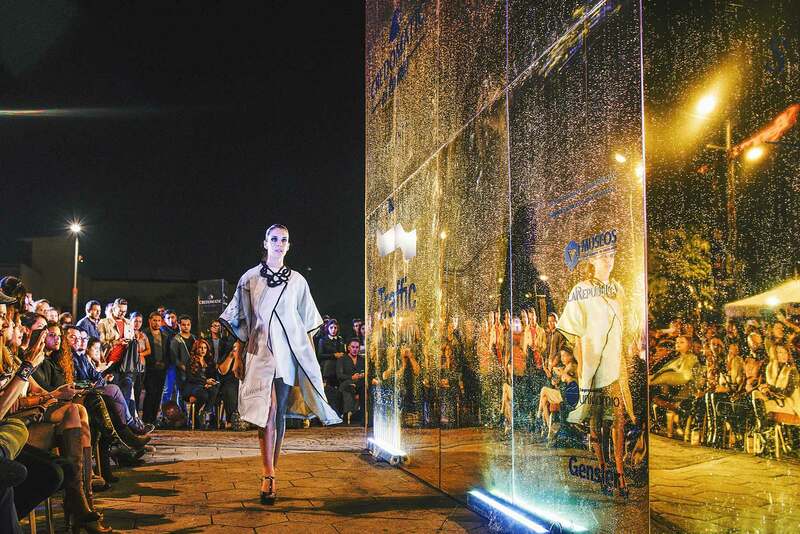 To celebrate the second year of Costa Rican fashion magazine Traffic, Gensler created a pop-up event on San José’s Plaza de la Cultura, above the Museo del Oro Precolombino. (Tienda de los Museos del Banco Central is its Gensler-designed retail space.) The event’s focal point was a striking 5-by-5-meter cube pavilion. Its gold strands reached down into the museum, connecting the two and providing a dramatic setting for fashion. The cube’s reflectivity also proved to be a selfie-taking magnet. For the final weekend, Traffic turned the plaza into a runway, hosting a public fashion show featuring local talent. The design team of Richard Hammond, Federico Montero, and Anastacia Chaves showed that quick, inexpensive interventions can draw crowds to cultural landmarks—conveying how new uses can activate such sites. The popularity of mixed use in US cities reflects the fact that it’s “an asset that works for you 24/7, 365 days a year,” says Peter Merwin. The components activate each other to add drawing power. Take Buckhead in Atlanta and River Oaks in Houston. They were desirable areas, but not yet citywide destinations. Developer Oliver McMillan and Gensler teamed up to make this happen. Peachtree Boulevard and MARTA’s Red Line connect Buckhead to the city, but it felt internally disconnected and uninviting. 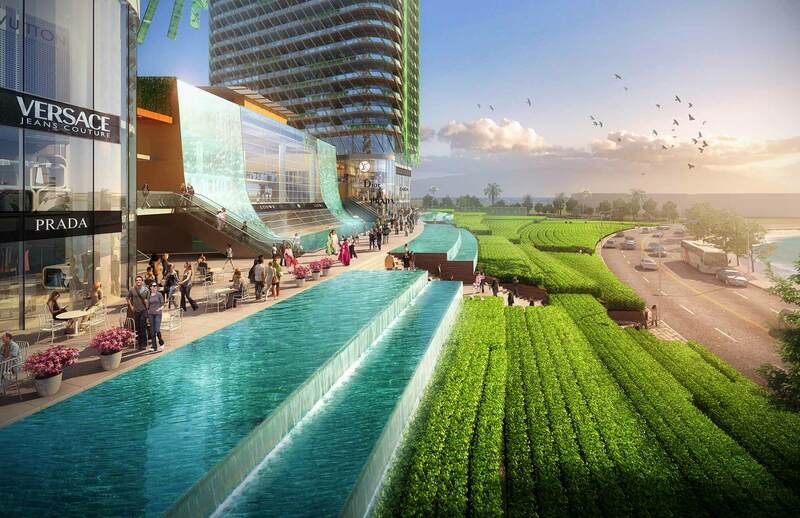 The 8-acre (3.2-hectare) project gives it a real center with upmarket housing, offices, a hotel, shopping, and dining. To root it in place, Paterson and his team wove in elements like covered porches, and paid close attention to the scale of the buildings and the qualities of the public spaces. “Street parking, sidewalk widths, landscape, canopies, and the spaces between the buildings—these details induce people to walk around,” Paterson says. Many of the restaurants have roof terraces that overlook the lively streets, while pedestrians enjoy the buzz from above. Paterson knew the project was a success when he took a taxi to Buckhead and the driver asked, “The Village?” That the locals had named Buckhead’s new center means they see it as a real place. River Oaks District—Houston, Texas. Image © Scott Frances. In Houston’s River Oaks, Gensler gave a spread-out commercial zone a center. The 15-acre (6.5-hectare) project crowns restaurants, a cinema, and retailers like Cartier, Dior, and Hermès with a hotel, office space, and housing. Landscaped, shaded sidewalks connect it all to create a walkable district with a downtown feel. Entertainment is a theme of the ARK Group’s Music Factory, designed by a Gensler team led by Barry Hand. 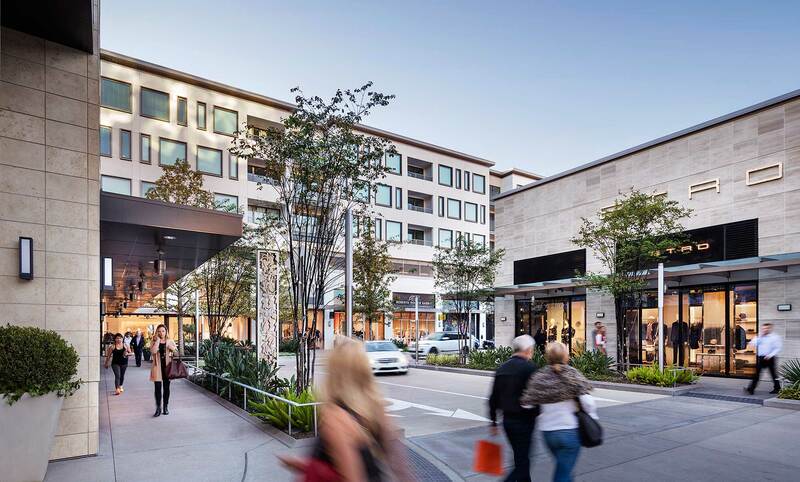 Located in Irving, a major business center in metropolitan Dallas, the goal of this public-private partnership development is to spark nights-and-weekends vitality. “Rapidly growing segments of our communities are looking to work and play in the neighborhoods where they live,” Hand says. 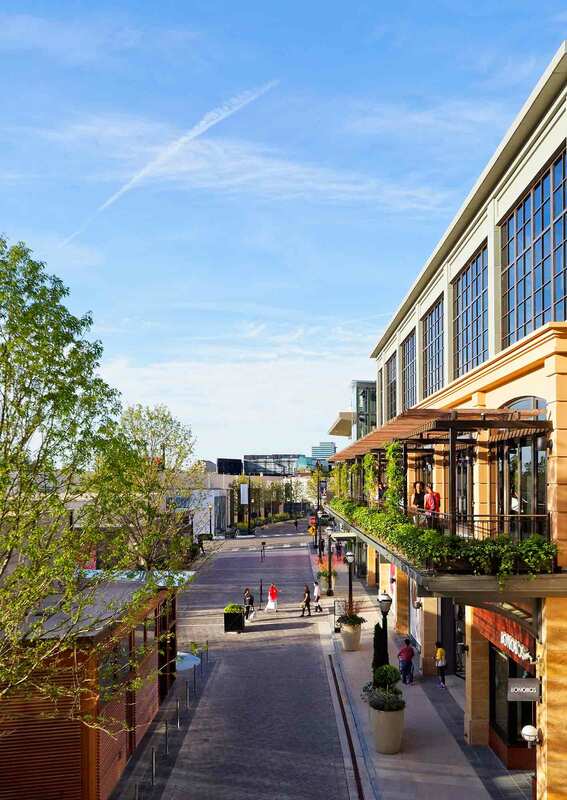 The Music Factory’s concert venue—totaling 8,000 seats, indoors and outdoors—faces a new community-serving plaza surrounded by offices, dining and entertainment venues, and a boutique movie theater. Entertainment, sports, and conventions all draw crowds. Gensler used all three to help AEG turn L.A. LIVE into a destination that keeps fans and energy downtown after the events are over. Now John Adams, Olivier Sommerhalder, and their team are designing a Metropolis, a mixed-use center for Greenland Group on a pivotal 6-acre (2.43-hectare) site. It will open with a 38-story residential tower and a 19-story hotel along Francisco Street—recast as an easily walked route to the convention, financial, and civic areas in downtown Los Angeles. Penny Craswell, a Sydney-based writer, is a contributing editor of Architectural Review Asia Pacific and Mezzanine magazines. Her blog, The Design Writer, covers Australia. Amanda Kolson Hurley, based in Washington, DC, is a contributing editor of Architect magazine and a regular columnist on architecture for Washington City Paper.